The University of Cape Town’s Energy Research Centre recently undertook an alternative technical assessment of South Africa’s electricity future to inform debate on IRP 2018, South Africa’s latest electricity plan, which is due to be released shortly. The authors used a similar modelling methodology, with the addition of an economic model to account for key indicators such as employment and economic growth and assessed all the key assumptions used in the draft IRP 2018 against available evidence as the basis for their analysis. They also assumed that existing coal power plants will be required to conform with current air pollution legislation, which will impose further costs on the existing system not taken into account by the draft IRP 2018. In addition, they assessed the suitability of one of the most important drivers of the IRP – the greenhouse gas emissions constraint – in the light of South Africa’s overall mitigation potential, with the aim of understanding better the contribution which the electricity sector should be making, especially in the light of future contributions to the global mitigation effort South Africa will be required to make in the next decade. A least-cost electricity investment plan using the best available evidence on key parameters. These include realistic technology costs and learning curves for renewable energy and batteries, more realistic plant availabilities for the Eskom fleet, and compliance of the existing coal fleet to the Air Quality Act (AQA) and Minimum Emission Standards (MES). A least-cost, low-carbon scenario compatible with the Paris Agreement’s long-term temperature goal of limiting warming to “well below 2°C”. Methodologically, they assessed the economic implications of various greenhouse gas (GHG) emissions budgets, and this scenario represents a more ambitious climate change mitigation approach than the current “peak, plateau, and decline” trajectory in the NCCRWP. 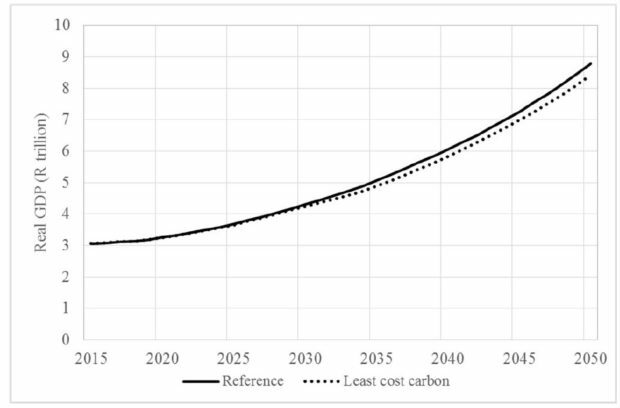 The authors modelled a 7,75 Gt CO2-eq budget over the period 2020 to 2050. This equated to reducing emissions below the low-PPD budget by around 20%, without imposing large costs on the economy. Fig. 1: Greenhouse gas emissions in least-cost mitigation scenario with carbon intensity of electricity. One of the key critiques of the draft IRP 2018 is that it does not adequately address the central problem of climate change mitigation, even though the electricity sector currently accounts for more than 40% of South Africa’s emissions. There are two dimensions to this problem. The first dimension is the extent to which the proposed IRP can be said to be aligned with South Africa’s current climate change policy. The authors argue that the emissions constraints derived from the national emissions trajectory benchmark range contained in the National Climate Change Response Policy (either the “moderate decline”, the “advanced decline” or the “carbon budget”) do not reflect a least-cost mitigation pathway from the point of view of the national economy. Some low-carbon technology investment options in the electricity sector are now cheaper than high-emitting options – a dramatic change from a decade ago. Mitigation options in the rest of the economy are considerably more expensive, and so from a national point of view, emissions constraints for the electricity sector should be far more ambitious, to avoid imposing additional costs on the rest of the economy. This problem was addressed by using a full sector energy model rather than an electricity sector-only model. The second dimension of this problem is that under the Paris Agreement, South Africa is obliged to submit a Nationally Determined Contribution (NDC) every five years which represents a progression on the previous NDC. Moreover, it is clear that all countries will have to increase their mitigation ambition to collectively meet the Paris temperature goal of well below 2°. The recently released IPCC Special report on 1,5° forcefully underlined the importance of urgent additional mitigation action. Fig. 2: Real gross domestic product (GDP). It is highly likely that as part of the global effort to address climate change, South Africa will therefore be required to increase its mitigation efforts in the 2020s and 2030s, and that its future NDCs will move towards the lower end of the PPD range, or even below. For example, Climate Action Tracker has deemed the country’s current mitigation commitment under the Paris Agreement as “critically insufficient”, based on the upper range of the PPD. This implies that if other countries had the same level of ambition as South Africa, we would be heading for a world with more than 4°C of climate change. The lower range of the PPD is rated in 2025 and 2030 as “2° compatible”, meaning that this would be a fair contribution to the Paris temperature goal. In the long term (in 2050), the PPD range is rated as “insufficient” (meaning a 3° world) at the upper end, and “2° compatible” at the lower end. Therefore, meeting the global temperature goal of “well below 2°C” will require moving below the low-PPD. It will be even more important under these circumstances to pursue rapid decarbonisation of the electricity sector, to avoid additional mitigation costs to the rest of the economy. Fig. 3: Electricity investment and price. Existing analyses of the national emissions budget corresponding to the low-PPD trajectory include a rapid phase-out of coal in the electricity sector, with all coal-fired stations retired between 2035 and 2040 (Burton et al, 2018). This is broadly consistent with international analyses that have examined the future of coal in the power sector globally (see UNEP, 2017 for a review of the extant literature), most of which includes a global phase out of unabated coal in the power sector by 2050 (depending on country-specific circumstances). The IEA’s “well below 2°C” scenario (WB2D) also includes decarbonising the South African electricity sector by 2040. 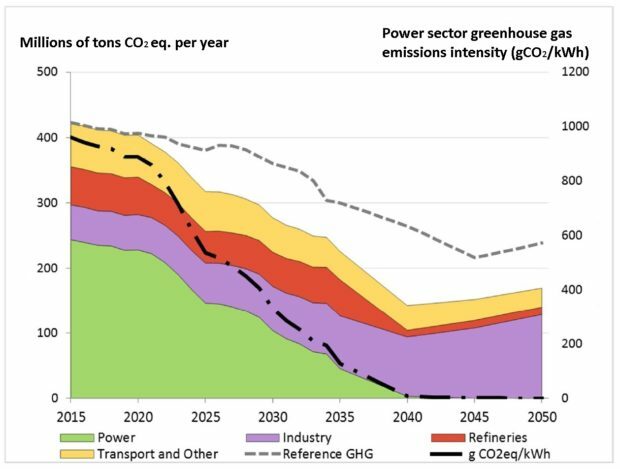 Finally, the IPCC Special Report on 1,5°C has shown that globally, coal in the power sector is phased out by 2050 in all scenarios consistent with 1,5°C (IPCC, 2018). The methodology applied in this study was to assess the effects of various GHG budgets on the electricity price and the economy. The emissions budget applied in the least cost mitigation scenario represents an ambitious reduction below low-PPD, but at relatively low economic cost. Peak demand in 2050 totals 65 GW and total installed capacity in 2050 is 229 GW including battery storage. The installed capacity is made up primarily of wind and solar PV (161 GW), and a small contribution from existing coal (9 GW) and pumped storage (3 GW). Investment in new battery storage technology begins in 2026, growing to 53 GW by 2050 to complement variable renewable energy technologies. Wind, solar, and batteries provide the least cost option for South Africa’s electricity future. By 2030, renewables (wind, solar, micro-hydro, and biomass) produce 42% of electricity, and this increases to 90% by 2050 (wind and solar together contribute 38% and 88% in 2030 and 2050 respectively). The higher demand forecast illustrates the important role of full sector analysis: in the reference case, large scale electrification of transport takes place. By 2050, 66% of private passenger vehicle activity is from electric vehicles, and 63% of road freight (primarily through the use of electrified light commercial vehicles). Transport demand for electricity accounts for 10,8 TWh and 40 TWh in 2030 and 2050 respectively. The reference scenario includes large scale retrofitting of Eskom power stations to meet the 2020 MES (“new plant standards”) by 2025. For the remainder of the fleet, plants must either implement the technology options to meet the 2020 new plant MES or else retire over the period to 2025. The results show that the least cost option is to retrofit most of the fleet with a total of 18 GW of plant retrofits across the fleet over the period to 2025. A total of 31 units are retrofitted out of a possible 42 across the fleet. All stations available for retrofitting are partially or fully retrofitted except Majuba, which is fully decommissioned by 2025. The remainder of the coal fleet is also sensitive to coal cost assumptions, even without any emissions constraints imposed on the scenario. While Medupi runs at maximum capacity factor (80%) to 2050, Kusile (with higher coal costs) starts to run at a much lower load factor from 2040 onwards, running at only a 41% load factor to 2050. The high penetration of renewable energy in the electricity sector results in a reduction in emissions over the period. Energy and industrial emissions fall from 422 Mt CO2eq to 238 Mt by 2050, again, without any emissions constraint applied to the scenario. In industry, there is little change in the mix of energy carriers – namely coal and electricity. Coal continues to be a primary source of process heat and emissions in industry and grows over the period with increased industrial growth. As mentioned above, transport electrifies substantially, although some fossil fuel use remains. On the supply side, Sasol’s Secunda CTL plant retires between 2040 and 2045. Although the electricity sector does not fully decarbonise over the period, the carbon-intensity of the electricity sector declines dramatically, from 891 gCO2eq/kWh in 2020 to just 81 gCO2eq/kWh by 2050. Emissions for the electricity sector for the period 2021 to 2050 total 3,6 Gt CO2eq, which is considerably lower than any of the IRP cases (which all remain above 4,9 Gt over the same period). The most stringent emissions constraint in the IRP (the “carbon budget” approach) constrains emissions to 5,5 Gt over the same period. Clearly, since the actual emissions budget achieved in an economy-wide model for an unconstrained least-cost scenario is so much lower than this, this constitutes a significant overallocation of emissions space to the electricity sector. This will become more apparent below in the mitigation scenario. In this scenario, the linked energy-economy model is run with the same labour and capital supply and productivity growth forecasts as the reference scenario but with the 7,75 Gt emissions budget applied over the period to the energy system. 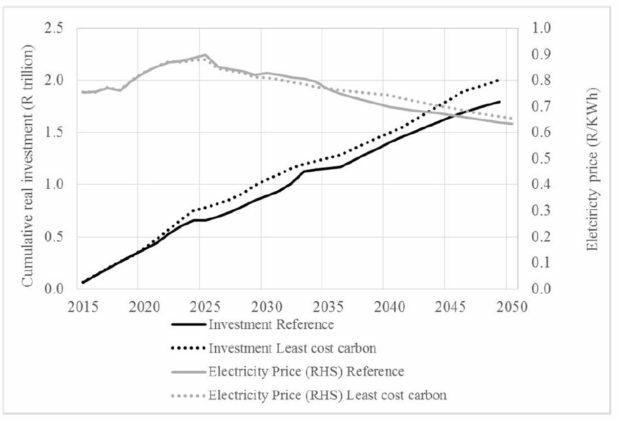 In this scenario, the impact of the carbon budget on the energy system feeds back into the economy-wide model through the electricity price and the total investment requirements in the energy system. This affects economic growth which in turn impacts demand for electricity. The result is a total demand for electricity of 312 TWh in 2030 and 542 TWh in 2050. This is a slightly lower than the reference scenario owing to the impact on GDP growth but only marginally so at 7 TWh difference to the reference. Peak demand for electricity is similar to the reference scenario at 65 GW in 2050. As with the reference scenario, all new electricity generation capacity is a combination of wind, solar PV, and battery storage. Total installed capacity is 113 GW by 2030 and 240 GW by 2050. The installed capacity is 11 GW higher than the reference case by 2050 despite the lower electricity demand, and renewable energy technologies (wind, solar, micro-hydro, and biomass) provides 62% of electricity generated by 2030 and 99% by 2050 (wind and solar together make up 57,3% and 96,3% by 2030 and 2050 respectively). Compared with the reference scenario, there is an accelerated investment in renewable energy in the medium-term – particularly as more coal capacity comes offline in the 2020s or is run at lower load factors. There is still coal capacity available in the long term from Kusile and Medupi (but not Majuba), however Kusile operates at a 55% load factor and Medupi at 75% load factor from 2026. Neither station generates electricity from 2040 onwards, though they remain available to the system. Coal capacity is lower in this scenario owing to more stations retiring instead of being retrofitted for compliance with the MES. In total, 11 GW of coal capacity is retrofitted, compared to 18 GW in the reference scenario. In this scenario, Kendal station is not retrofitted at all and retires by 2025 along with Majuba. Lethabo, Matimba, Matla and Tutuka are partially retrofitted and partially retired. Due to the lower capital cost expenditure on retrofits and earlier retirement of coal plants, the electricity price is lower in the medium term compared to the reference scenario. The electricity price is higher in the long term compared to the reference case as higher investment in renewable energy and storage capacity is required to meet the emissions constraint. The higher investment in renewable energy plus batteries is needed to replace retiring coal capacity, Medupi and Kusile post-2040, as well as the renewable capacity installed in the 2020s (when the capacity becomes due for replacement in the 2040s). Fig. 1 shows there is a general decline in emissions from 2015 onward, but this trend accelerates from 2020. The power sector contributes the largest mitigation effort, as discussed above – with fewer coal units operating overall and those that do run operating with lower load factors and result in an electricity carbon intensity of just 8 gCO2eq/kWh by 2040 and zero by 2050. There is also a significant mitigation contribution from coal-based synthetic fuel production as these CTL facilities are offline between 2035 and 2040 compared to 2045 in the reference scenario. The CTL facility also reduce their production levels over their lifetime. Lower demand for liquid fossil fuels for transport (driven by lower GDP and higher electrification of transport) results in emissions savings relative to the reference scenario. As in the reference scenario, transport is largely electrified and thus most of the emissions savings would come from upstream power sector emissions savings. Although the rate of growth is lower for the industrial sector relative to the reference scenario, and despite higher uptake of fuel switching to electricity, coal remains the lowest-cost supply option for heat in the industrial sector. In the long term the industrial sector becomes the largest source of emissions from energy in South Africa – the majority of these from process heat requirements, particularly from boilers. Including an emissions constraint of 7,75 Gt CO2-eq has a small negative impact on real GDP with the real GDP level being 4,2% lower by 2050 (Fig. 2). This translates into a 0,14 percentage point decline in the average growth rate and implies that the level of real GDP experienced under the unconstrained least cost scenario in 2050 would be delayed by between one and two years. The lower level of GDP is the result of the higher electricity investment requirement, which results in lower available funds for investment in other sectors; as well as a higher electricity price. Total electricity investment is 11,6% higher under the 7,75 Gt CO2-eq scenario, while the electricity price is 3,4% higher by 2050 (Fig. 3). Employment is 4,1% lower (1,84-million job-years in 2050), in line with the lower real GDP level. Lower levels of activity are experienced across all sectors of the economy in the 7,75 Gt CO2-eq scenario with the largest declines in activity taking place in the mining and manufacturing sectors. Mining and manufacturing GDP is 4,6% and 4,3% lower by 2050. The largest declines within the manufacturing sector occurs within the non-metallic minerals, metal products and motor vehicles sub-sectors who are typically energy intensive users. The differences in employment are the largest in the services sector which is the largest employer in the country. Employment in the services sector is 1,32-million job-years lower in the 7,75 Gt CO2-eq scenario. The next largest differences are in the manufacturing and other industry sectors which employ 237 000 and 165 000 fewer workers than in the reference scenario. Employment losses are largest amongst higher educated workers (i.e. Grade 12 and higher levels of education). This study has examined the implementation of a least-cost scenario for South Africa’s electricity sector to 2050. The findings have implications for the IRP 2018 which is currently being updated by the DoE. Firstly, the study reiterates earlier findings that future supply will come primarily from wind and solar PV. Renewable energy plus flexibility provides the least cost pathway for Fig. 2: Real GDP; Fig. 3: Electricity investment and price the electricity sector. No new coal or nuclear power plants feature in South Africa’s electricity future, and their inclusion would require subsidies from consumers (Burton, et al, CSIR, 2017, Ireland & Burton 2018, Steyn, et al, 2017). Secondly, this study has also shown that a large-scale procurement programme for battery technology to provide storage capabilities for variable renewable energy should be pursued in South Africa. Third, retrofitting power stations for compliance to the minimum emission standards (MES) is, for the most part, the least-cost option for the electricity sector (due to the relatively higher costs of new technologies in the period 2020 to 2025). It is cost optimal to retrofit Eskom’s coal-fired fleet to meet the new plant standards by 2025 rather than retire them, except in the case of Majuba. There are potential cost and greenhouse gas emissions savings if compliance to the new plant standards is suspended for some stations (e.g. Duvha and Matla) and they are retired early. The authors propose that the DEA considers suspending compliance requirements for the best performing (in terms of pollutants) stations and in exchange Eskom agrees to retire the stations by 2030 at the latest. For the remainder of the fleet, Eskom should commence retrofitting the stations for compliance to the MES, subject to ongoing cost assessments (e.g. coal costs per station, which may alter whether a station should be retrofitted or retired). Finally, this study has examined the effects on the electricity system, the energy system and the economy of a more ambitious climate change mitigation policy. The study shows that phasing out coal in the power sector by 2040 is cost optimal for South Africa to fulfil its commitment to the Paris Agreement goal of limiting warming to well below 2°C without significant impact on the economy, and that therefore the country can afford to be more ambitious in its mitigation policy. Reducing emissions below the level of the low-PPD by 2050 can therefore be achieved through rapid decarbonisation of the electricity sector and fuel switching. A well-below 2°C compatible pathway is possible with only a 4% reduction in GDP in 2050 – translating to a delay of between one and two years in absolute terms in achieving the same economic growth level in 2050. The IRP 2018, which currently allocates more than 5 Gt of greenhouse gases to the electricity sector, should therefore significantly reduce this allocation in line with an economy-wide, least-cost allocation of emissions space to different sectors. Even with no emissions constraint, this reference case achieves lower emissions than the IRP budget.